Adapted from a slow cooker recipe from Betty Crocker, what I liked about this Tortellini Stew is that you don't need to saute anything beforehand and none of the ingredients require refrigeration. I would suggest lighting plenty of coals as you need to bring the liquid to a boil quickly before adding the tortellini. In my 10 inch dutch oven I placed 12 coals in a ring around the bottom and covered the lid with 26-28 briquettes. I prefer this more on the thick and filling side but if you like it more along the lines of a soup, add a little less pasta. Make it even easier by chopping your vegetables before you leave home. For a heartier dinner, toss in some sliced, pre-cooked Italian or chicken sausage with the tortellini. 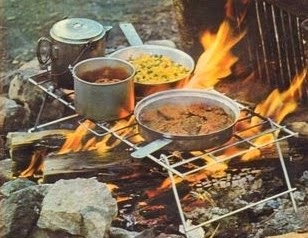 An easy camping and pot luck recipe, be sure to bring the Parmesan cheese and a good crusty bread for mopping up the sauce. Combine onion, red pepper, zucchini, chicken broth, tomatoes, beans and spices in prepared dutch oven. Cover and cook with as many coals as needed to bring liquid to a strong simmer, about 15 minutes. Stir in dried tortellini, stir well. Simmer for 20-25 minutes until stew is bubbling and tortellini are tender. Our garden is convulsing with the production of vegetables, so this recipe appeared to be the ideal way pare down the volume. I used squash as well as zucchini, and tossed in some french beans as well. Both of my sons gave it a thumbs up, and the wife is always happy when she is given a reprieve from the kitchen by the appearance of the black pot. Excellent, quick, simple, and tasty!